A Cataract is an eye disease that causes clouding of the lens inside your eye. Those who suffer from cataracts have problems in recognizing colours, changes in contrast, facial recognition, and driving at night. Cataracts are a very common eye issue that occur due to age, and are the leading cause of blindness, worldwide. Adults 65 years of age and older should have an eye exam at least once per year, where your eyes will be closely examined for cataract formations. If you experience any of the symptoms above between appointments at any age, you should give us a call immediately for a check-up. In the early stages, it is possible to reduce the effect of cataracts through glasses, or contact lenses. As the disease progresses however, surgery is essentially the only option for regaining your pre-cataract visual power. Cataract surgery is a very straightforward procedure, and typically takes less than 15 minutes. With cataract surgery, the lens of your eye will be removed, and replaced with an artificial lens. 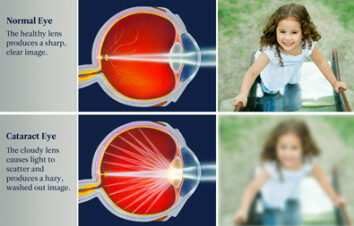 After you fully recover, the artificial lens will act just like your previous lens, and will require no additional day to day care. After surgery, you will still need to wear any glasses or contacts that were required before your cataracts began to form. However, in many cases, it is possible to combine cataract surgery with a refractive correction like LASIK, which will allow you to get rid of your glasses as well! The two main types of cataract surgery are Phacoemulsification, and Extracapsular Cataract Extraction. This is the most common, and advanced type of Cataract surgery. With Phacoemulsification, one or more incisions are made on the periphery of the eye.Then, Ultrasonic waves are used to break cataract into small pieces. The cataract is then removed from the eye, and an intraocular lens implant (IOL) is placed in the now empty lens capsule. This form of cataract surgery requires a larger incision to be made, as the cataract will be removed in one piece. One or more small incisions are made on the front portion of the lens capsule, from which the lens is then removed. An IOL is then placed inside of the lens capsule, and the incision is closed. This method is generally used when you have advanced stage cataract, and the phacoemulsification procedure is not possible. Both forms of cataract surgery are outpatient procedures, meaning that you will be permitted to return home immediately following your procedure. At Cedar Park, we provide all the necessary pre and post surgery requirements for this amazing procedure. There are some strict aftercare requirements to be followed in the few weeks following your procedure, which will all be clearly explained by our knowledgeable staff prior your surgery date. We will be there for you every step of the way, ensuring that you are calm and comfortable before, during, and after your surgery. If you’re ready to free your vision from cataract distortion, and regain control of your life, please give us a call. We’d be more than happy to meet with you and discuss the benefits of this safe and effective procedure, today!